Characterization is part of crop the breeding process aims to protect biodiversity and preserve local germplasm. Indonesia has two known species of Portulaca, Portulaca oleracea and P. grandiflora. Thirteen Portulaca accessions have been collected from Bogor area, comprising five accessions of Portulaca oleracea and eight accessions of Portulaca grandiflora. This study was aimed at the characterization of the 13 accessions and was undertaken at Indoflower BLST, Bogor, between October 2015 to February 2016. The results showed a significant difference in the color of flowers between the two species of Portulaca. The most significant difference is the overall appearance of P. oleracea species. Character color and shape of the flowers between the P. grandiflora white (GW) and P. oleracea are similar. Significant differences between the species exist in relation to the root systems, but the root systems of accessions within each species are generally similar. The branching characteristics between the two species and among accessions are generally similar, with branches emerging through the base of leaves or nodes. However, there are differences in the leaf characteristics between the two species. 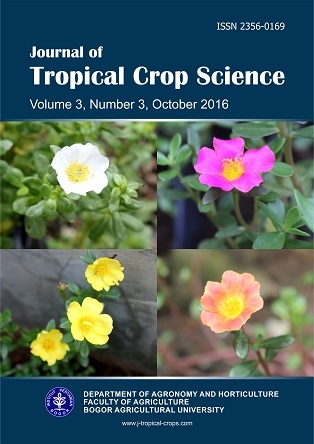 This study has provided information on flower characteristics of P. grandiflora and P. oleraceae which will be valuable for future breeding efforts in Portulaca. Aisyah, S.I., Khotimah, and Krisantini. (2014). Evaluation of commercial sunfllower (Helianthus annuus L.) cultivars in Bogor, Indonesia for ornamental and nursery production. Journal of Tropical Crop Science 1, 13-16. Alam, M.A., Juraimi, A.S., Rafii, M.Y., Hamid, A.A., Aslani, F., and Alam, M.Z. (2014). Effects of salinity and salinity-induced augmented bioactive compounds in purslane (Portulaca oleracea L.) for possible economical use. Elsevier 169, 439-447. Fenster, C.B., Diggle, P.K., Barrett, S.C.H., and Ritland, K. (1995). The genetics of floral development differentiating two species of Mimulus (Scrophulariaceae). Journal of Heredity 74, 258–266. Jonas, V., Dunn, S. and Satcewicz, M. (1972). Life history as related to weed control in the Northwest: 7 species of purslane. Northwest Regional Publication, The University of Massachusetts, Amherst, USA, Research Bulletin, 598. Kementrian Pertanian. (2015). “Statistik Produksi Hortikultura 2014”. Direktorat Jenderal Hortikultura. Kementrian Pertanian. Jakarta (ID). Kim, B.G., Kim, J.H., Min, S.Y., Shin, K.H., Kim, J.H., Kim, H.Y., Ryu, S.N., and Ahn, J.H. (2007). Anthocyanin content in rice is related to expression levels of anthocyanin biosynthetic genes. Journal of Plant Biology 50, 156-160. Nisa, S. (2008). “Analisis Preferensi Konsumen Terhadap Aglaonema Hibrida Lokal”. Thesis. Institut Pertanian Bogor. Rao, I.M., Miles, J.W., Stephen, E., Beebe, and Horst, J.W. (2016). Root adaptations to soils with low fertility and aluminium toxicity. Annals of Botany 118, 593-605. Suardi, D. (2002). Perakaran padi dalam hubungannya dengan toleransi tanaman terhadap kekeringan dan hasil. Jurnal Litbang Pertanian 21, 100-108. Syukur, M., Sujiprihati, S. and Yunianti, R. (2012). “Teknik Pemuliaan Tanaman”. Penebar Swadaya, Jakarta. Uddin, M.K., Juraimi, A.S., Hossain, M.S., Nahar, M.A., Ali, M.E., and Rahman, M.M. (2014). Purslane weed (Portulaca oleracea): prospective plant source of nutrition, omega-3 fatty acid, and antioxidant attributes. The Scientific World Journal 14, 1-6. UPOV. (2008). “Guidelines for the Conduct of Tests for Distinctness, Uniformity and Stability”. Portulaca: TG/242/1. UPOV International Union for the Protection of New Varieties of Plants. Geneva.